WordPress navigation menu system is easy-to-use and versatile way to quickly add and display posts, pages, custom links and categories in the navigation menu. 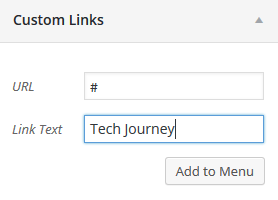 Thus, be default all menu items on WordPress link to a URL. However, you may need to add a non-link text to the navigation menu, such as adding a unclickable menu title or text label that expands a sub-menu when hover over or tap. In WordPress admin panel, go to the navigation builder (Appearance -> Menus). In the left column, expand the Custom Links section. Enter # in the URL text field (remove the http:// if it’s displayed). 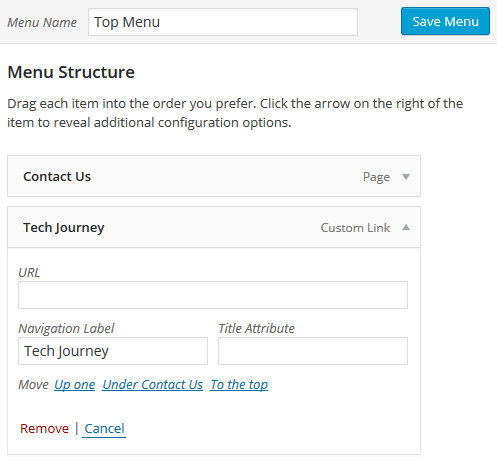 Enter the text that you’d like to display on menu in the Link Text or Label text field. Click Add to Menu when done. A new menu item will be added into the right column, with the text your entered as its label. Expand it, and remove the # from the URL text field. If you don’t remove the # pound sign, the text is clickable, but it doesn’t do anything thus the page stays the same. Drag the text menu item to the location you preferred, then click Save Menu.